Update: Web-push notifications are now enabled for the Chrome browser. This article has been updated with new information. How many subscription channels are you offering on your blog? If you haven’t already enabled the must-have subscription options, you should do that now. 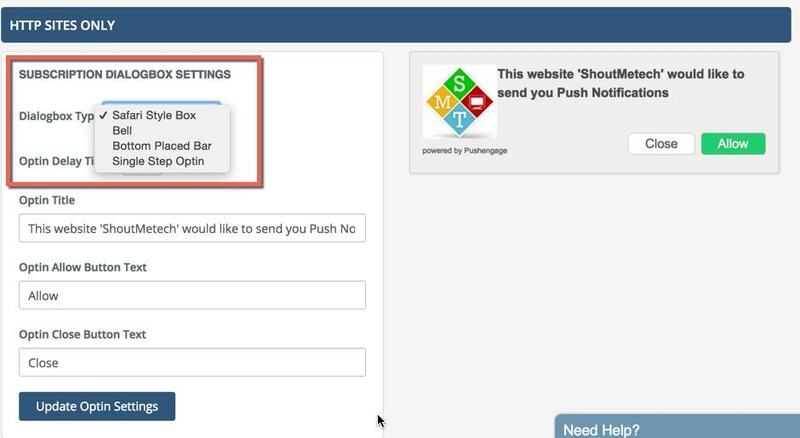 Using the PushEngage service, you give another subscription option to the readers of your blog who are using Chrome (all platforms) or Safari on Mac OS. If you are using a smartphone (iOS or Android), I’m sure you are aware of push notifications sent by your installed apps. Web-push notifications are similar to smartphone push notifications where your subscribers will be notified when a new post is published or when you manually send a push notification. PushEngage is an awesome service that allows you to send these push notifications. In this tutorial, I will show you how easy it is to enable push notifications for your WordPress blog. 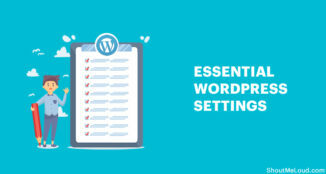 You should open your WordPress blog’s admin panel and follow along with this tutorial. 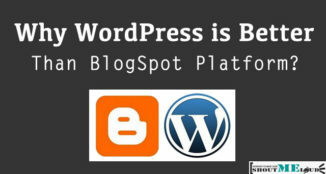 Within 5 minutes, your WordPress blog will be web-push notification enabled. The setup part is quick and easy. So let’s get started with this step-by-step guide. First, go ahead and create an account on PushEngage over here. 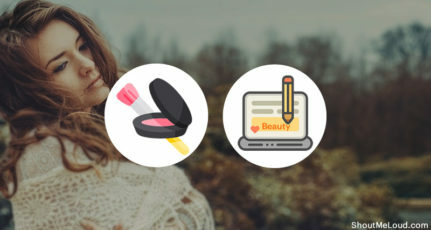 The free account allows you to send 120 push messages per month for 2,500 subscribers, which is a decent number for a small and medium-sized blog. Once you have signed up for an account, you need to add your blog’s name and add your blog’s logo. This is useful for the branding of your push notifications. Upon activation of the plugin, click on PushEngage > Dashboard. 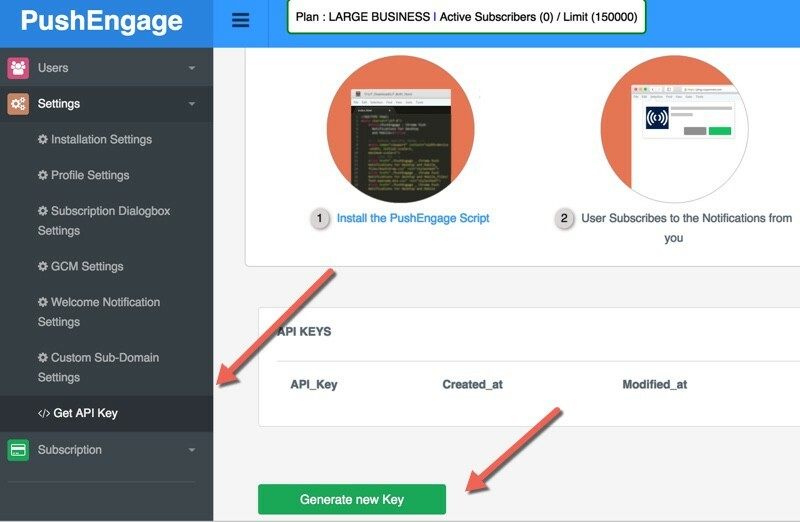 To activate the plugin you need to get the API Key from your PushEngage account. I have marked the points in the below image that will help you create the API Key. Once you are done activating the plugin, now you need to configure the subscription settings. This is where you will configure the prompt that users will see to subscribe to your push updates. I use “Single Step Optin” for ShoutMeLoud & I suggest the same for you. “Safari Style Box” is another popular method. Once you are done and logged in, you will see a dashboard like the one below (in the screenshot). It will show you the stats of existing subscribed users and other details. You can click on the “Send A Notification” tab to send a custom push message anytime. This value is pretty crucial & you really should create your GCM account. If you are not so tech savvy, you can ignore it. However, using this documentation will make the process easier. If you want to send a welcome message to users who subscribed to your notifications, use this feature. You can ask users to download your mobile app or send them to your top resources. 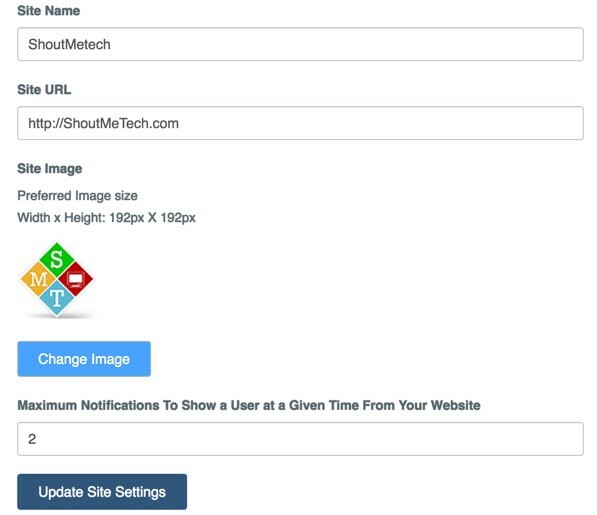 In your post writing section, you will see an option to send push notifications when you publish or update a post. Try not to send too many push notifications in a short span. 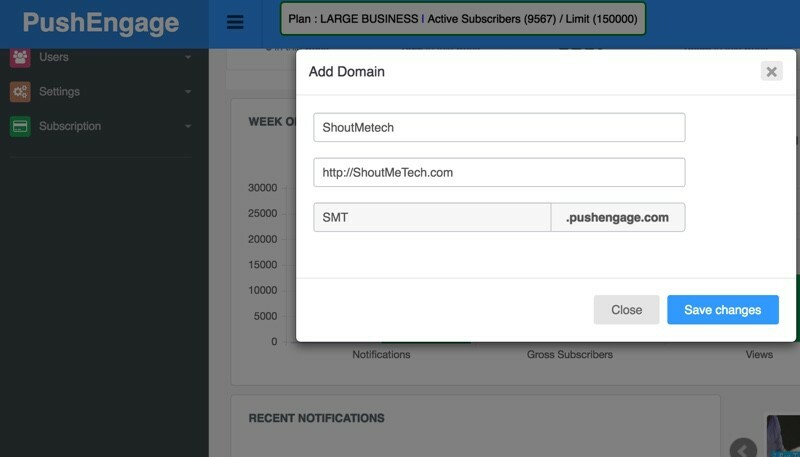 In the next guide, I will share a few tricks of PushEngage to help you make the most out of push notifications. Do let me know your experience with web-push notifications. Do you know of another modern subscription option that I should cover here on ShoutMeLoud? What I am doing wrong? Can you help me? 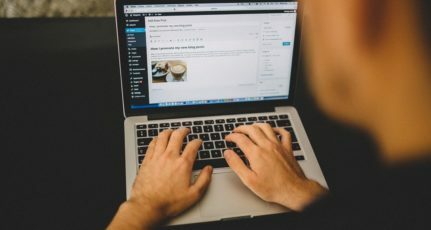 Thanks Harsh for sharing a great WordPress plugin to engage more visitors with the own blog I am definitely trying this technique. Thank you for such great article. 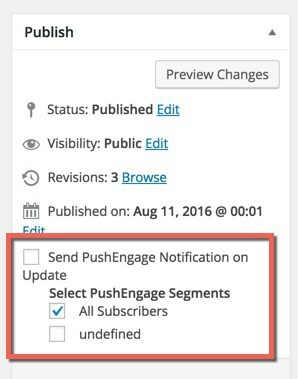 pushengage is one of the best free push notification plugin for WP. I’m using this on my blog. You are the inspiration for me. I am new in this field and don’t know anything about it, that’s why I try to follow you. 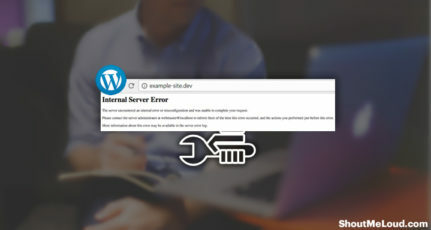 One of the best site I ever found for WordPress tutorial. 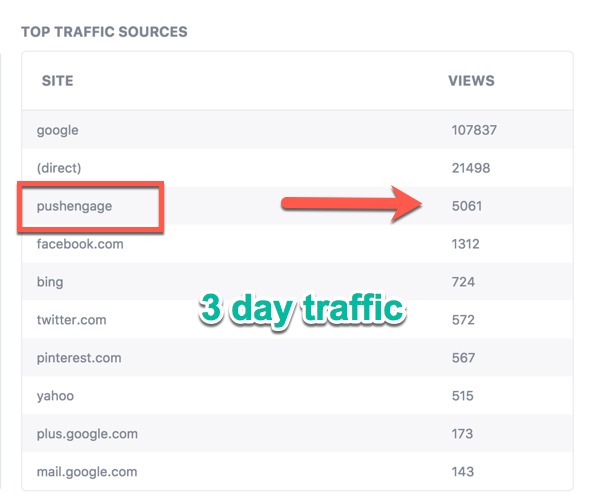 After reading this post I installed Pushengage on my site and within 15 days, I got 67 subscribers. But today as soon as I updates this plugin, my site was down. After calling customer care of bulehost india, they deactivate all plugin and told me to activate one by one. But Pushengage show ‘Fatel error’ which activating this plugin and they said me to install other plugin. Seems like some kind of compatibility issue with PushEngage plugin. Do write an email to [email protected] & he would help you fixing this issue. Good and well written article!! Much informative to get revenue by generating the organic traffic through various notifications or subscriber features of the browser. Push Engage is awesome, but what about one signal one? most of my friends suggest me to use one signal and its free to use. Thanks Harsh Configured it. Good to see you are even promoting plugins which has just 900+ downloads.. I have been using the free version of Pushcrew on my website Blogmantra, but sadly it is only for desktop notifications. I need to upgrade in order to have mobile notifications. Does the free version of Pushengage cover for mobile notifications too ? Pushengage website is not reachable at the moment. Wondering if they have shut it down! Any other alternatives for pushengage that you would like to suggest? It was temporary errors & it should be backed up now. I am also using the pushengage notification on my blog and it is really amazing. I want to limit the notification for a subscriber. How to do that? You can start sending notifications manually. Thank you for this detailed tutorial. I have tried some plugin but it didnt seem to work. I have recently started blogging. Infact I have written 3 posts so far. I write whenever I get free time. This is new experience for me and your website was recommended to me by a friend. Nice tutorial, thanks for sharing! 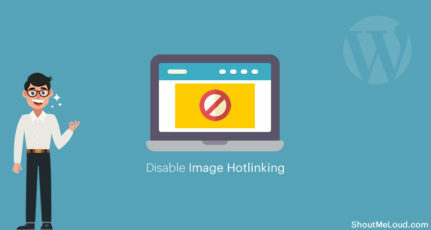 Is there a way to add large images using push engage wordpress plugin ? 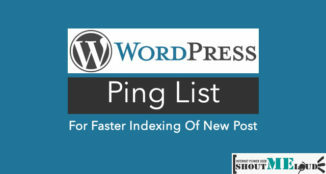 They have this feature on the website (When using their web panel) but not for WordPress plugin yet. Thanks for the tutorial. I have added pushengage. Running onesignal push on viralchop.com and it works well. It would be really good if there was a setting to allow users to only receive notifications from the category that they clicked the bell button from.